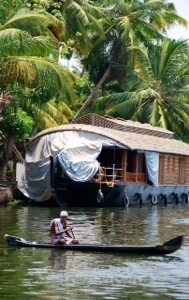 Twoandahalfweeks in India – beautiful decadent backwaters tour – Go India, go future! 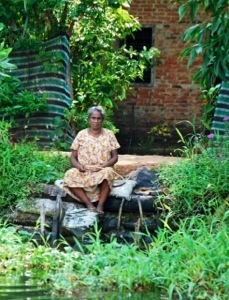 Alleppi is a small town and the starting point for our backwaters tour in Kerala. ‘A tour you should not miss’ – that’s how travel guides describe it. 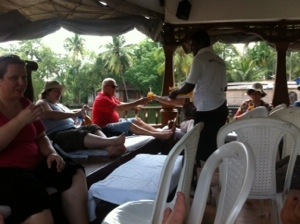 It is one of our last days here in India. After having visited many projects in rural and tribal villages, explored Indian ways of life from Mumbai to Tamil Nadu, learnt that much about different needs and organizations, get used to hot and humid temperatures, had a lot of interesting talks and discussions from university professors, visited home children and tribal families where we have spent two days in their houses, we will become real ‘tourists’: two days of pure relax are on our schedule. Somehow becoming suddenly a ‘rich’ western tourist on holidays is strange in this world of extreme poverty and social needs. But India is used to live with contrasts. It is really luxurious: There are different options how to spend some hours on a boat or ferry by deeping into this fantastic backwaters’ landscape. 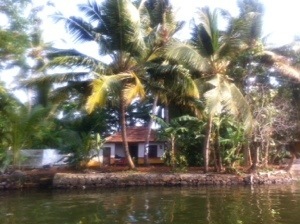 The backwaters are a system of natural and artificial channels, covering an area of about 3000 km2. Probably the most luxurious way is to rend a houseboat including a cook, a boat captain and someone who just serves you food and drinks on request. 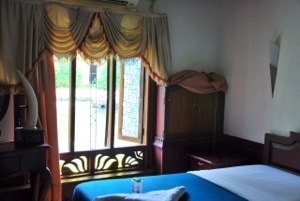 On board you find a kitchen and some exclusive rooms to sleep, of course with own bathroom each, a sophisticated boat veranda with huge soft cushions where you can just relax and enjoy. It reminds me somehow of historical miniature parks in Europe where you can get an idea on how people lived in the past. The channels are not used just as transportation ways, but are an essential part of the peoples’ daily life. 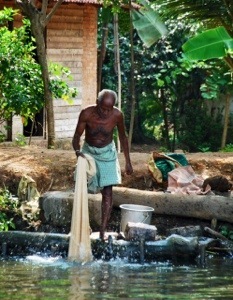 Passing by the houses we see washing, fishing, swimming and chatting men and women. There are temples, small shops, houses, some shops, playing children and agricultural areas with huge rice fields, as well. And watching again and again lying or sitting on our huge cushions, enjoying the sun, enjoying life. Intensively, no hurry, no stress. Finally time just to relax. It is a kind of revenue of scenes we have lived during the last fourteen days. Like a theatre play and we are the visitors. At the end I have taken more than 100 photos during this boat tour. This country with all it’s people and colors is a paradise for photographers. The people are proud to be photographed, and getting into contact is easy. A friendly ‘vannakam’, a smile or a greeting are door openers. Often they stop smiling and take a serious look when photos are taken. Not, because they do not like it. I assume it is more a phenomena to demonstrate the importance of the moment. Meanwhile, In Germany we force ourselves to smile … What a strange world! Whenever possible many Indians want to know where we are from and which are our names. Indians are gentle people, they make you feel welcome. During our travel I have never met an unfriendly or obviously egocentric person. Social structures, relationships and family play an enormous role. They give you a positive perception of the world. Thinking of all the needs and problems I have seen here I wonder sometimes how they manage to be rather optimistic and apparently also that positive thinking. But they simply do it – independent from being young or old, poor or rich, women or man.